After a considerable amount of guest and volunteer feedback regarding single-use plastics and recycling at Unite, the Planning Team has been very conscious in its planning to reduce plastic use across the event. There are a number of issues outside of our control but something we can do is to remove the disposable plastic bottles provided at meal times. 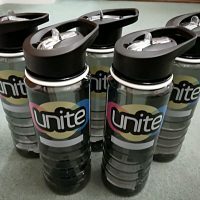 in our 5th anniversary year, we have decided to give all guests and volunteers a complimentary, reusable Unite branded water bottle! The bottles are of good quality and we hope that you will reuse them at future events. Any additional bottles can be purchased from the Café and on the booking form in the future. There will be water points available around the site for guests and volunteers to refill their water bottles. We’re thankful for your support in helping us to reduce the plastic use across Felden Lodge at this year’s event. Unite 2019 – group bookings now open!